So, about 3 weeks ago, I decided it would be fun to grow some mint, because summer is coming and I want to drink Mojito's. Yes, that is the sole basis of my decision, but it's a great reason. But because I like to make things more difficult than they need to be, I decided to grow my mint from seeds. I also think it gives me a greater sense of achievement if I can pull it off. - The mint is Peppermint. - The pot I use is in plastic, 27cm in diameter, and 14cm deep. - The pot is in my room, near the window. It receives 3~4 hours of direct afternoon sunlight, and multiple more hours of indirect sunlight. - I water it once or twice a day, depending on how hot it was that day (and therefore how dry the soil is). - The average temperature in my room is about 28C, can go up to 30C+ during the afternoon, unless I'm here with the AC on. It is also quite humid. - The soil I use is just some random soil, I didn't really look at the details on the bag; it had pictures of vegetables and herbs on it, so I figured "close enough", but I don't know about the actual quality. I still have the bag if it becomes something important I should check. 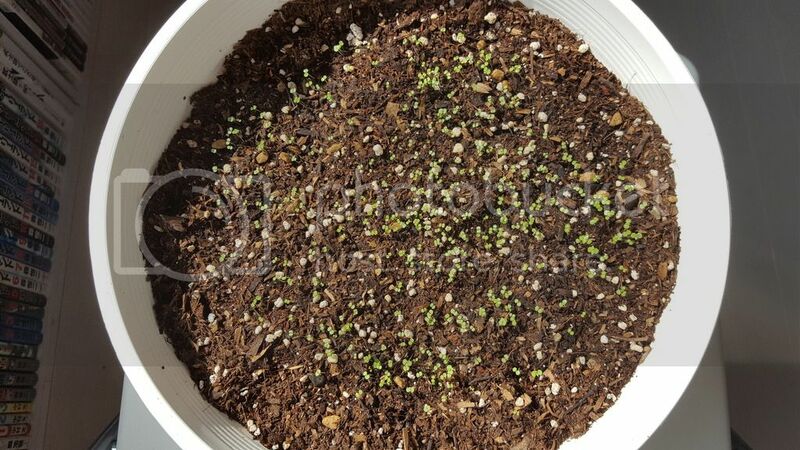 1) Is this how the mint should look like after 3 weeks since I planted the seeds? 2) Do I have to select only a few stems to keep and get rid of the rest to avoid roots getting tangled? 3) If so, how far apart should the remaining plants be, and when should I start pulling the rejects out? 4) I've been spraying water on the seeds and seedlings with a spraying bottle to avoid drowning the minuscule seeds or hurting the baby seedlings. When should I start pouring water instead? Thank you so much for your future advice. I am completely new at this, but I am having a lot of fun. Last edited by applestar on Mon Jul 18, 2016 10:37 am, edited 1 time in total. Mint does take some time to grow, so yes, that is exactly how it should look like after 3 weeks. I'd wait a little more until you seperate each seedling and pot it seperately. Being this small and delicate, it would be too hard to transplant them without breaking them. I'd wait until they are AT LEAST one inch tall to transplant them. Are you even planning on reporting them? Or will all stay in that pot? If you want your mint to stay in that pot, I'd have 3 mint plants grow there. If you want more than 3, get a bigger planter/container. Keep spraying the seedlings instead of watering them until they reach 1 inch, and then you may start pouring the water, if you wish to. How warm is it outside? If it's over 20 °C, I'd definately move them outside when they get to 1 inch tall. They'll do better outdoors in the sunshine. And I'd highly recommended getting either a bigger container or get a second one so that more mint can fit in it. I'd say that in the container you have now, definately no more than 5 plants can fit. The soil looks fine in my opinion. Since the seeds germinated in it, it must be good! Thank you Anna for your reply. I also asked other people for their opinions on this, and here is what another person answered. Maybe someone could share what they think about it. 3) 2 or 3 inches but don't pull them out. Snip them off. Now this is where things are very different. Following this suggestion, it would leave 10~15 plants in the container. According to Anna, I should have 3 in that container, and definitely not more than 5. Also, I'm interested in what your thoughts are regarding the "don't pull them out, snip them off" part. Any help is greatly appreciated and welcome. Once they get their true leaves you can gently water from the top, very gently so you don't wash the seedlings out of the soil. Do you have any place outdoors where you can put your extra plants? If so I would let the whole mess grow to about 2 inches tall and divide into 4 or 5 sections. Just take a knife and cut the top of soil like you would a pie. Spoon out each section and plant in a prepared spot. Break off a clump containing just a few plants for replanting in the pot. Mints grow pretty fast once they get going. In a couple years even a single plant in a pot will need to be divided. They produce roots along any stems that lay on the soil surface. How to Plant Rosemary - How to Care for and Grow?